An organization can determine its HPO status by conducting an HPO Diagnosis. During the HPO Diagnosis managers and employees fill in the HPO Questionnaire (available in 15+ languages), in which they indicate how well the organization performs on the 35 HPO characteristics, on a scale of 1 (very bad) to 10 (excellent). Thereupon the average scores on the five HPO factors is calculated and put into a graph. From this graph it can be seen whether the organization is already an HPO (which means a score of at least 8.5 on all HPO factors) and which HPO factors show a dip in the graph and therefore have to be improved. During a workshop with management and employees the results of the HPO Diagnosis and the HPO graph are discussed and an action agenda, with actions to improve the HPO scores, is drafted. In the next one to two years, the organization then has to work dedicated on these actions in order to improve its HPO scores and its competitive performance. With the HPO Diagnosis we discover your organization’s strength and show you where improvement is necessary! What do the executive teams of competing firms actually compete on? Not on their firm’s products and services, that is the company’s output. In fact, executive teams primarily compete on the quality of their insights about their own organization. The first basis of competition between executive teams is the understanding of what really happens in their organization. What we thought we bought: a change initiative, a methodology and an answer to our problems. What we actually got: a framework for change, a common language and something to get behind. What did it feel like: uncomfortable at the start, connecting & satisfying and a boost in performance. The main reason for starting an HPO Diagnosis is management’s strong wish for the organization to excel. In addition, there are quite a few other reasons for starting the HPO-diagnosis. Click here for a list of eight of these reasons as given by the clients of the HPO Center. Competitive advantage. Achieving higher HPO scores means better financial results, and when the organization achieves the highest average HPO score in the sector it also has the best financial results in comparison with its competitors. 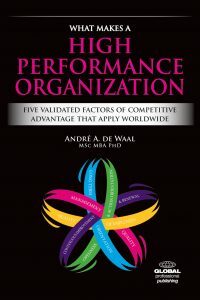 The same is true for organizational units when these are compared to each other: the units with the highest average HPO scores also have the best financial performance of all the units, and vice versa.